Three VW EV concepts: the I.D. hatchback, I.D. Vizzion sedan and I.D. Buzz minibus. FRANKFURT -- Volkswagen will consider plans to convert its factories in Emden and Hanover, Germany, to build electric cars during a strategy review on November 16, a report in German daily Handelsblatt said. 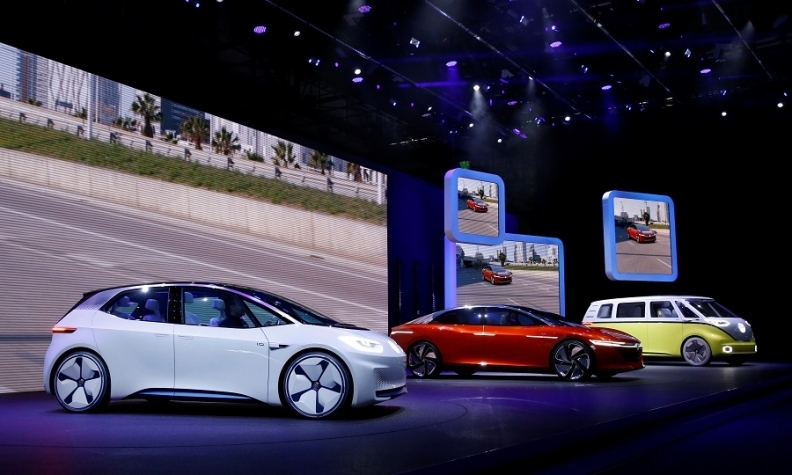 VW Group plans to build 10 million electric cars based on its new modular MEB platform, as it targets the launch of worldwide mass production toward the end of 2022. VW currently builds the VW Passat midsize car in Emden but the sedan segment has suffered from sagging demand as customers flock to buy SUVs, prompting a review of the factory's future. The Hanover plant builds vans including an electric version of the Crafter, along with the Amarok pickup and Tiguan SUV. VW will start series production of the battery-powered I.D. hatchback in Zwickau, Germany, in November 2019.